I'd always wanted to make a lamp out of old books... don't ask me why, I just wanted to. I picked up a couple of boxes full of books at an auction last fall and finally got around to doing something with them. 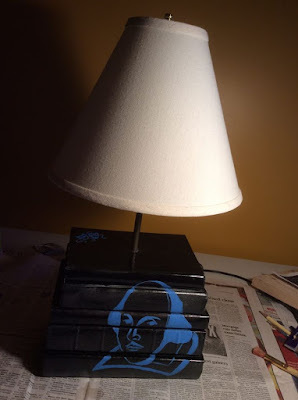 The idea of a book lamp isn't particularly original so I wanted to put a twist to it. I painted the books black and then added the Shakespeare silhouette to the side, and the comedy/drama masks in the top corner.